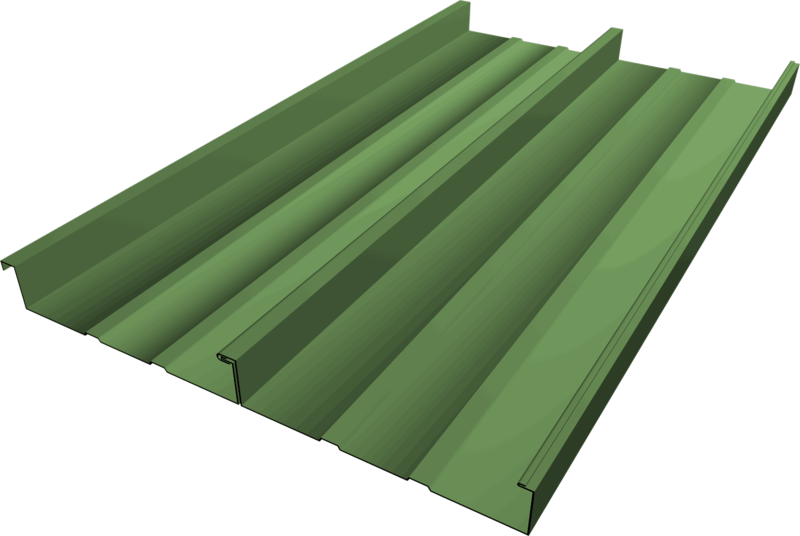 Flexospan manufactures three varieties of standing seam roofing panels. Click on the items below to access additional information for each panel. The flat-pan profile and 1.5"-deep seam on the Flexospan Standing Seam 1.5 Series metal roofing panel makes it ideal for highly architectural projects which have varying elevations and transitions, and for projects over decking or wood and felt substrate. Stiffening ribs are standard but are removable upon specific request. The Flexospan Standing Seam 18 metal roofing panel is designed for both new and retrofit projects. With a seam of 2 5/8" or 2.625", an overall coverage area of 18" and stiffening ribs as standard, the FSS-18 is especially useful where strength over open purlins is required or where there are long runs with limited openings. The Flexospan Standing Seam 316 metal roof panel is a straight-sided, non-trapezoidal metal roofing panel that's simple to install and flash. It's best suited to roofs with continuous transitions or mansards and for light industrial and commercial-grade applications. For years, the only option for roofing materials was asphalt shingles. The were only a few other choices, and they weren't cost-effective. And standing seam metal roofs were often unattainable for average homeowners. Most stand seam installations were done on commercial buildings or modern, avant-garde residential structures. But now, they're available for industrial, commercial, and even residential purposes. Asphalt and composition shingles have their advantages. For one, they're the least expensive. One problem with asphalt is that, being derived from petroleum, prices of the shingles do vary. Another problem is how shingles tend to fill gutters with shed minerals, and after a decade or so, they get worn-out. Standing seam metal roofs are completely different. Not only is the type of material different but the size and shape of the material and its installation method are different, too. Many homeowners find that the higher initial cost of this type of roofing will pay off in the end because of its greater durability and reliability. Houses in your neighborhood with metal roofs most likely are of the standing seam variety. Continuous panels run from the ridge of the roof all the way down to the eaves. Between the panels are seams connected by fasteners which are raised above the level of the metal roofing. This is where we get the term standing seam, because the seam is raised or standing, as opposed to flush-mounted. These seam fasteners might be anywhere from 0.5" to 1.5" high. Because these fasteners are concealed, you only see a smooth continuous ridge extending from top to bottom. Roof panels can come either pre-formed or site-formed. Pre-formed panels are created in an off-site factory. Site-formed panels are created from rolls of metal that are run through mobile forming machines which crimp the metal into rigid panels. Because the metal panels run unhindered from the top to the bottom of the roof, not only are there no horizontal seams but in total the roof has a far fewer number of seams. Tough: Yes, metal is tough--very tough--but it's not impervious to all hazards. The sheet metal in this type of roofing can be penetrated by heavy falling limbs or dented by a severe hailstorm. All metal roofing in general is considered a "cool roof" by the US Environmental Protection Agency. This is because metal roofing can be painted any color, including colors on the lighter end of the spectrum which will prevent solar heat gain. Standing seam roofs are perfect for certain types of contemporary or country-style houses. Due to the smooth, straight lines, these roofs give your house an "industrial" feeling, yet with a modern flair. These are not the rippled tin roofs that you might remember from warehouses of the past. Metal comes in a decent array of colors: grays, browns, forest greens, earthy reds. Perhaps this isn't the full palette of colors as you might find at a paint store, but it's more than you'll find with composite/asphalt shingles. There are many roofing contractors who install conventional roofs, but far fewer contractors install metal roofing, and fewer still install them well. This means that you will be searching longer for a good roofer and that total project cost may be higher because competition in the market is lessened. "Roof pitch" refers to the angle of the roof's slope. Certain types of metal roofs do not lend themselves well to flatter (or completely flat) pitches. Snap-lock panel metal roofs are not advisable for roofs with a pitch of 2:12 or less (2 feet of vertical rise for every 12 feet of horizontal rise). However, with a better quality mechanically seamed panel it is no problem to go to a 1/2:12 pitch. You can even bump the seams up to 2" with a butyl seal for those applications. It's important to note, too, that when you get to these lower pitches, you're also below the recommended minimum pitch even for conventional shingles. Generally, these safely go down to a 4:12 pitch, with some shingle manufacturers warranting their product down to 2:12. Metal is considered a moderately-expensive roofing material (more expensive than conventional shingles, but less than high-end slate or copper). However, metal's higher cost can be amortized via its longer lifespan. 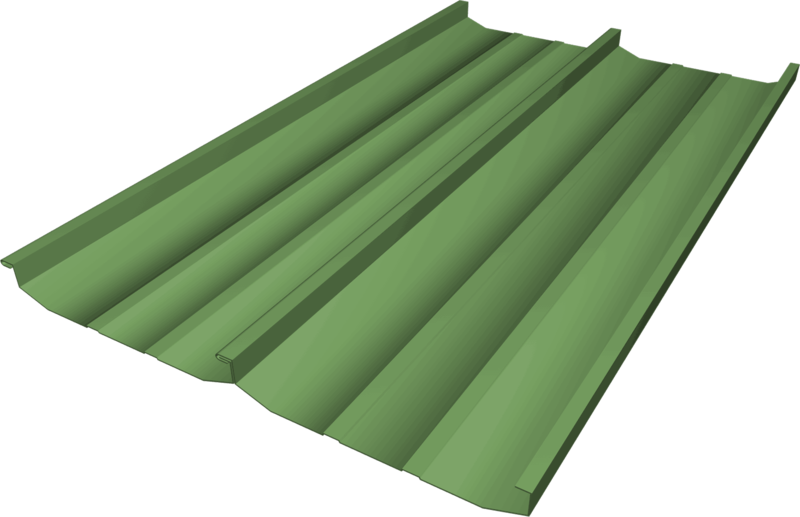 Our standing seam metal roofing panels are available in a variety of materials, coatings, colors, and gauges. Popular sheeting materials includes galvanized, stainless steel, and aluminum. Our standing seam coatings include vinyl plastisol, fluorocarbon, and siliconized polyester. 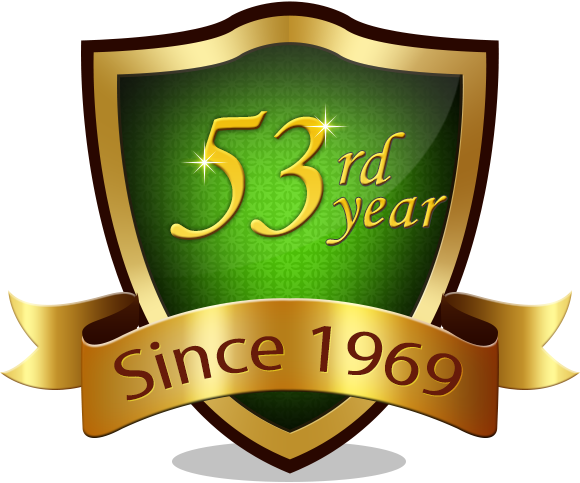 View our color chart to view all the available metal panel colors. View the details of each standing seam roofing panel to get info on available metal panel gauges. Call Flexospan at 800-245-0396 to discuss standing seam metal roof costs, weight, and installation. Our sales people can provide a timely quote for standing seam metal roof panels and accessories, such as snow guards, clips, girts, and rods.